Just under 1 in 3 Spokane County area high school seniors drank heavily in the past 2 weeks and just under 1 in 5 area high school sophomores drank heavily in the past 2 weeks. No idea if this is better or worse than elsewhere. Youth alcohol consumption is big problem most everywhere. I looked this up because someone asked me about it. 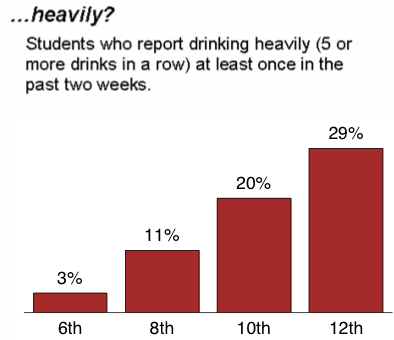 43% of high school seniors and one third of sophomores have been drinking in the past month. More data here. Data from 2008. This is the first week that we have seen all categories simultaneously decrease slightly. Data Source: US Census, Washington State’s WorkForceExplorer.com. The lines are poorly labeled: “Pop” refers to the total population of Spokane County and “Annual” refers to the number of non-farm employed or roughly the total number of people working. While the population has gone up, the total number working has gone down. The next chart converts the above into a percentage. 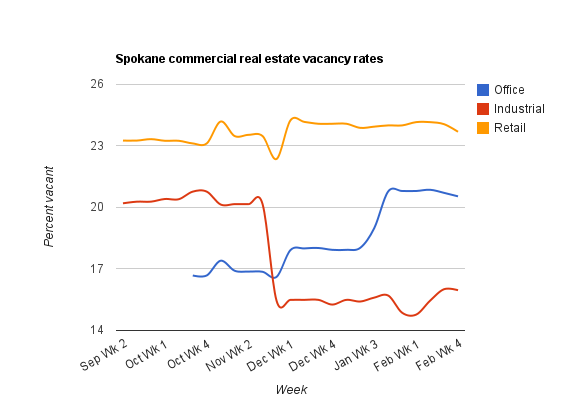 At the present time, the total employed has fallen to less than 44% of the Spokane County total population. This drop means either there has been a sudden influx of very young people (children) or a sudden increase in the retired community – or a lot of people have given up trying to find work. Considering that the drop occurs simultaneous to an economic depression, it seems likely this is due to the actual loss of jobs. The data come from the State’s WorkforceExplorer.com web site and is based on the number of non-farm employed. 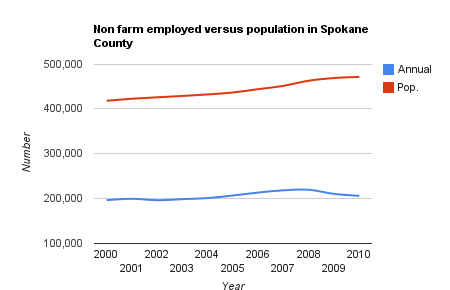 (Farm labor in Spokane is negligible.) The totals do not include the self employed, sole proprietors and active duty military. The chart that follows shows the percentage that is now employed dropping sharply from 2007. The X-Axis is missing but runs from 2000 to 2010. This item may relate to the item, below, that finds 20% to 23% of the Spokane County population will be age 60 or over by 2020. The previous item on the City of Spokane snow plowing has been completely re-written. An earlier news story implied it would take until end of day Tuesday to complete the snow plow operation. While that is strictly true, nearly all of the city has been plowed as of the end of Saturday, which means this was completed in about 3 days, which is much improved from last fall (and 2 and 3 years ago). Please see the previous item for the update. CensusScope — Population Pyramid and Age Distribution Statistics. Note the “double bump”. The bump between 35-54 is the post World War II “Baby Boom” effect, and the second bump is the “Baby Boom Echo” effect as those in the first group had their own families. About 2.5% of the population in the year 2000 is age 80 or greater. This impacts the prior item on this blog, which estimated that 20% of the population will be in the age group 60 to 79 by 2020. By 2020, 20 percent of Spokane County residents will be age 60 to 79, up from 14 percent today. via Home prices still falling from bubble. The above estimate of 20 percent is for those aged 60 to 79. As of 2000, about 2.5% of the population was over the age of 80 and that too will likely grow. Let’s assume 3%, meaning that by 2020, 23% of the population will be age 60 or older. As this shift occurs, there will be a smaller percent of residents available for working in industry, including manufacturing, research and development and service industries. This implies a further shift towards a Spokane County based primarily on health care and government (including education) and low wage recreation, leisure and food service industries – and less so on manufacturing, industry services, R&D and an innovation economy. What percent of this shift in population is due to old people moving in versus younger people moving out? City to Plow Browne’s Addition On Monday & Tuesday…Cars MUST B – KHQ Right Now – News and Weather for Spokane and North Idaho |. This item has been completely re-written on Saturday. As of the end of the day Saturday, all but Browne’s Addition has been plowed – this represents most of the city of Spokane has been completed. This means most of the city was plowed within 3 days, down from 5 days that it took twice last fall. That would be good news – headed in the right direction! Many cities aim to clear their roadways within 24 hours. “Every time there is six inches of snow in Spokane“.